Like many marketers, you’ve included email in your marketing mix for years. But while email remains a vital channel, traditional email blasts often fail to help you achieve your goals. And it’s no wonder — your audience is already drowning in marketing messages. So what’s the secret to cutting through the noise? To connect with and engage prospective buyers, you have to look beyond impersonal, batch and blast campaigns. After all, one-to-one personalization and individual relationships increasingly drive the action during marketing communications. And that means you need to move beyond the limitations of your email service provider (ESP). 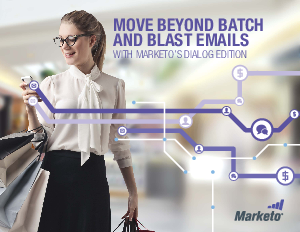 Download the ebook, Move Beyond Batch and Blast Emails, to see how you can achieve your marketing goals — whether you’re looking for higher open rates, higher click-through rates, higher audience engagement, or higher marketing-driven revenue.